A parachute pickup in GTA San Andreas. The Parachute is designed for only one purpose: to safely return the player to ground level after falling from a significant height. 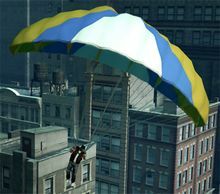 The parachute appears in Grand Theft Auto: San Andreas, The Ballad of Gay Tony, and Grand Theft Auto V.
In GTA games prior to GTA San Andreas, death by falling occurs less frequently, resulting in the lack of need for parachutes. While considerable damage may occur as a result of falling in Grand Theft Auto 1 and Grand Theft Auto 2, the top-down environment resulted in restricted height of buildings, lowering the possibility of such fatalities; with a full health, the player may fall roughly four times from a moderately high ramp before dying. 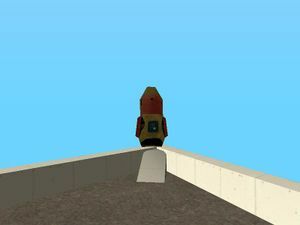 By Grand Theft Auto III and Grand Theft Auto: Vice City, the player is allowed to access rooftops of multistory buildings and skyscrapers, but the player's resilience to damage by falling in both games is increased to a level where it is possible to unrealistically survive jumps off from a substantial height (i.e. a moderately tall skyscrapers), although death may still be achieved by jumping off the rooftops of the tallest skyscrapers via extraordinary means (such as a third party teleporter or jetpack). A lack of aircraft and ability to eject from moving vehicle or technical limitations in early GTA games are also factors for the late adoption of the parachute. The parachute in GTA San Andreas when deployed. The player is able to control their rate of descent and turn with the parachute open, as they do when in freefall. The parachute HUD icon in GTA San Andreas. GTA San Andreas introduced a more realistic range of damage incurred to the player when falling, where the severity of damage is amplified; jumps from moderate heights will deduct substantial amounts of the player's health, while jumps from extreme heights may result in certain death. The parachute was introduced as a life-saving option, available in various high elevations throughout the state of San Andreas, including building rooftops, or after exiting any flying vehicles from great heights after obtaining a pilot's license. Utilizing the parachute is done by pressing the "fire" key, as with weapons. However, there are a few seconds of delay after leaping from an elevation before deployment is possible. Once the parachute is deployed, the player may control their descent by rotating left and right, and by pushing forward or pulling back on the main control to speed up and slow their rate of descent. Pulling back on the parachute also allows the player to land running, instead of falling prone, as occurs when not pulling back. Parachutes also introduce the concept of "freefalling" as the player is capable of entering a controlled diving position after jumping from a high altitude whenever he is wearing a parachute, rather than flailing whenever they fall from a height without one. The parachute can only be used once. After landing, the parachute is removed from the player's inventory. While introduced in GTA San Andreas, GTA games released prior to The Ballad of Gay Tony have not resumed the adoption of the parachute and retain pre-GTA San Andreas fall damage, albeit being slightly more realistic. Atop the tallest building in Downtown. Atop the Big Pointy Building in the Financial district. Atop the western tower on the San Fierro side of Garver Bridge. Atop The Emerald Isle casino. Atop Mount Chiliad, near the vista point, on the slope between the Camper and Journey. Atop the Tierra Robada-side tower of the Gant Bridge. Atop Arco del Oeste, inside one of the wooden structures. Atop the radio tower/control tower near The Big Ear. 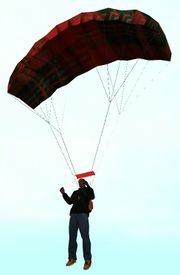 Since the parachute is controlled by the script, there could be times when the parachute will not function correctly. These glitches are rare but it can happen. When deploying the parachute, CJ can become stuck in free fall mode. So once he hits the ground, he gets wasted instead of landing safely. Hitting the water without deploying your parachute can make CJ stuck in skydiving animation in the water. The player can escape this glitch by spawning a vehicle and entering it. In the original PS2 version while doing the Chiliad Challenge, the player can jump off the mountain and deploy the parachute. The game will put CJ back on his bike but with the parachute stuck on him. The parachute model in the PC version is unable to display correct animations while the player is controlling it. For example, CJ, when the player is not pressing any buttons, holds onto the parachute. In the PS2 and Xbox versions, the bit which you hold on to go down once you slow your rate of descent will move. However, in the PC version, the bit where you hold on to it doesn't move. A deployed parachute in a pre-release screenshot of The Ballad of Gay Tony. The parachute HUD icon in GTA The Ballad Of Gay Tony. Parachutes are reintroduced in The Ballad of Gay Tony with a vastly improved design, flapping realistically with the wind when deployed. Parachutes are first used in the mission High Dive and then adopted for a number of missions in the game, and serves as an integral component for the game's interpretation of base jumps, which are available in single player mode as well as the multiplayer "Free Mode" (using the parachute in Team Deathmatch could allow for an entire team to paradrop into a combat zone). Base jumping in the game involves the player jumping off a number of skyscrapers in Liberty City onto moving trucks. After completing all of the jumps in single player, the parachute will appear in the player's safehouse. The Parachute can also be spawned via cheat code, by dialing the number: 359-555-7272 (The Parachute can be found in the players inventory). The parachute in the game also featured a glitch which could be exploited to allow the player to ascend instead of descend, remaining in the air for an indefinite amount of time. This specific technique has been patched but the glitch can still work using other techniques. The parachute spawns in the following places throughout Liberty City. At the top of the spire on Rotterdam Tower, right before the second ladder leading to the top of the aerial. On top of the Statue of Happiness' coffee cup. On the docks next to the helipad in Westminster which spawns a Buzzard after the storyline completion. A Base Jump is located here, too. On top of the building with the glass overhangs on the roof located on Rand Ave and Mahesh Ave. It is on the northeast corner of the roof. On top of the building located at Emerald St and Borlock Rd in Fishmarket South. This building has a helipad on top. In Luis Fernando Lopez' apartment after the completion of 15 Base Jumps. Atop Liberty State Pavillion Towers in Meadows Park. On the south end of the eastern legs of the Broker Bridge. On top of the dome-crowned building at the WTF Center. The first picture to reveal that parachutes are returning in GTA V. Rockstar Games has revealed the return of the parachute in a new screenshot on their website. Parachute as seen in December 2012's issue. The blue variant of the parachute in GTA San Andreas, as seen during the video demonstration of the "Parachute Onto Target" trial at the Flying School. 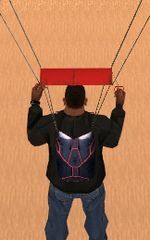 A second blue rectangular parachute backpack design exists in GTA San Andreas, although the player has no direct access to it; the parachute itself is otherwise similar. The backpack can be seen in at least two occasions in the game, one during the Flying School's video demonstration of the "Parachute Onto Target" trial, and another during "A Home in the Hills" where the backpacks are carried by the Triads to base jump into Madd Dogg's Crib. 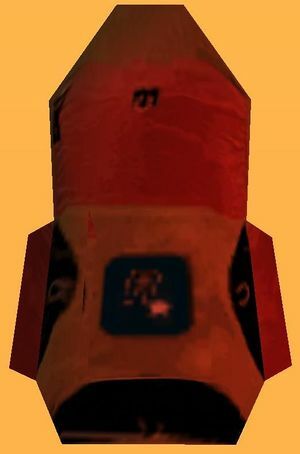 The back of GTA San Andreas' yellow-and-red parachute features a Rockstar North logo, whereas a ProLaps logo is present on The Ballad of Gay Tony rendition. The beta version of the parachute in The Ballad of Gay Tony was all yellow, not yellow, blue, and white as it is now. A deployed parachute can be seen in a pre-release screenshot of GTA V.
This page was last modified on 19 April 2015, at 19:53.